Throughout most of the winter, the regular single track trails that I ride during the summer are usually covered in so much soft snow that even my 26x4.8-inch tires sink right in, but today, following a very wet, dense snow that melted as soon as it hit the ground and left puddles and slush everywhere only to freeze solid a few hours later, the trails were perfect for my fat tire bike. Skiers may love fresh powder, but we fat bikers prefer the hard-packed snow and ice that is usually only found on well-used snowmobile trails in winter. The hill steepens, but I've learned that it's usually unwise to stand up on such steep climbs. With fat tires running about 6-8 PSI and 240 metal studs per tire, this bike can get traction on an ice skating rink, and even on an incline, the rear wheel seldom spins out as long as it has plenty of weight on it. However, the moment I move my weight over the front tire, the rear wheel is likely to slip. 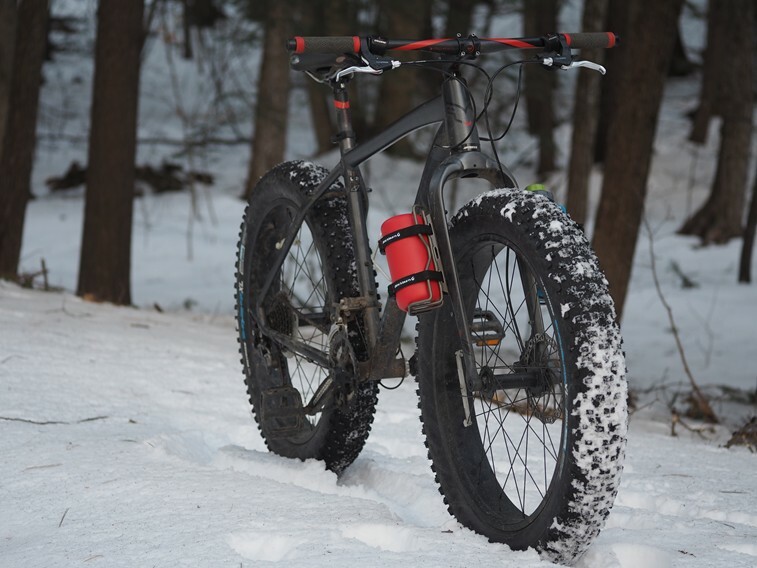 Slow and steady is the key to winter fat tire biking. Eventually I reach the limits of my endurance and I'm forced to push my bike the rest of the way to the summit. The sun is just about to reach the pine trees behind me and the clouds begin to display varying shades of orange and magenta. My stomach is telling me it's about time to open up my thermos and get something to eat, but as I let go of the brakes, I notice that the right brake lever feels strange. I soon realize that my rear brake is locked and the only way to disengage it is to manually pull the brake caliper to the open position. I suppose I'll have to further investigate the matter at a later time, but for now, daylight is fading and I'm going to have to make my way back home before dark. As much as I would love to enjoy my meal while watching the sunset from the summit of Blackstrap Hill, I know that with a mechanical failure on my bike, it would be wiser to wait and eat closer to home, so I get back on the bike and start making my way back using only my front brake. I may love extreme sports, but as an experienced Outdoor Educator and Wilderness First Responder who has had to treat or assist in the rescue of a number of injured hikers and skiers in the White Mountains of New Hampshire, I'm not one to take a lot of unnecessary risks. Nothing takes the fun out of a sport like having to quit for a few weeks or months due to an injury. I've done that before and it's not fun. As I get closer to home, I stop and unstrap my Hydro Flask Food Flask from the Blackburn Cargo Cage attached to my bike's fork and open the lid. The warm, steamy aroma of hot Harmony House Garden Veggie Chickenish Soup wafts up from the open thermos and I reach into my pocket for a spoon. Usually, when I'm out on day trips, I'll just take some granola bars or fig newtons, some trail mix, and a sandwich or humus wrap since bringing along a stove and cooking food on the trail is time-consuming and requires extra equipment that I have to carry, but after reading about thermos cooking on the Harmony House blog, I decided to give it a go. After a couple of hours of sitting in a thermos full of hot water, the vegetables were cooked perfectly. The soup was tasty and I must say, it sure beats eating a cold veggie wrap and fig newtons when it's 33 degrees Fahrenheit outside! While I had had some initial concerns that having a couple of pounds of extra weight from my water bottle and thermos on either side of my fork might make steering difficult, I never noticed a difference. The 18-ounce Hydro Flask Food Flask was also a great choice as it is wide and shallow enough to make it possible to spoon the contents out, unlike narrow-mouth thermoses made for drinking coffee. With that said, I recommend a longer-than-average spoon. The Blackburn Cargo Cages kept everything secure, well-balanced, and easily accessible. 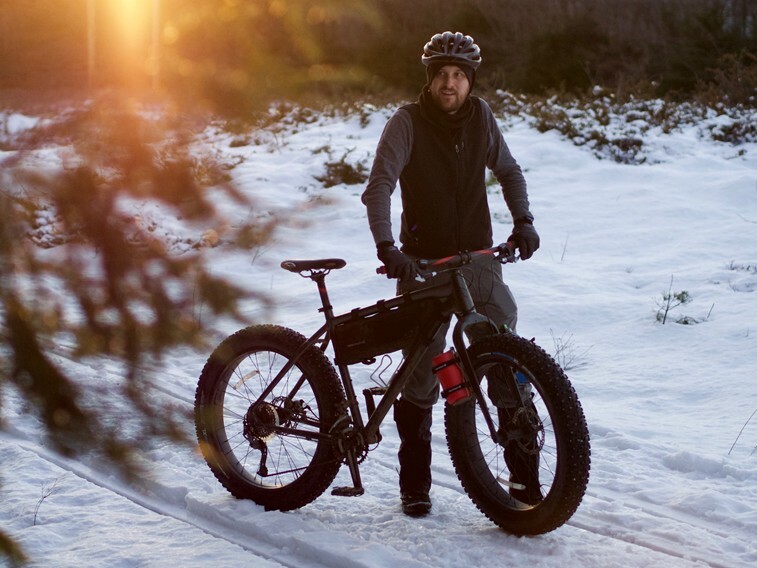 Overall, I'd say this system is a winner and I'm sure I'll be taking it on most of my future winter fat bike rides and perhaps some hikes, snowshoeing trips, and other adventures as well.